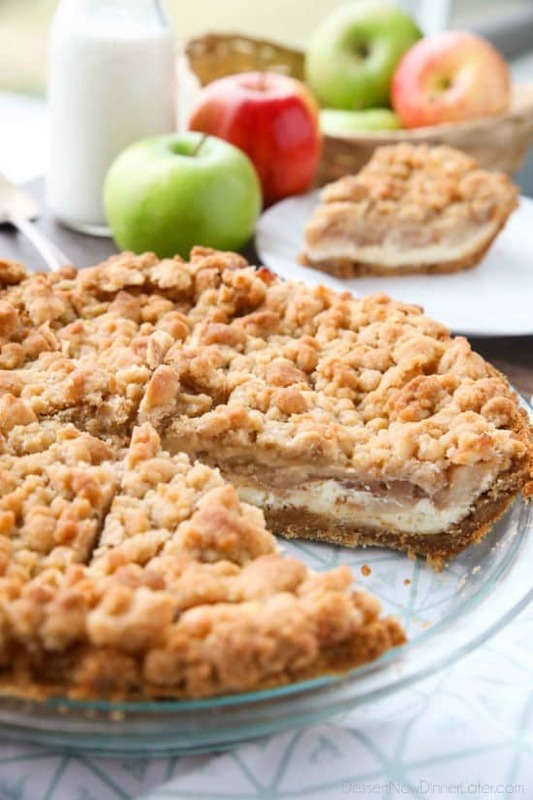 Apple Streusel Cheesecake Pie - Dessert Now, Dinner Later! 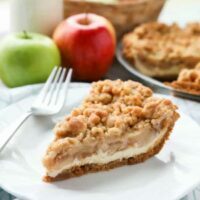 Apple Streusel Cheesecake Pie combines two dessert favorites with a graham cracker crust, creamy cheesecake layer, homemade apple pie filling, and crunchy streusel topping. I know Thanksgiving is over and most people move on from pie to other holiday desserts, but I’m a pie fanatic. And this one is just too good not to share! 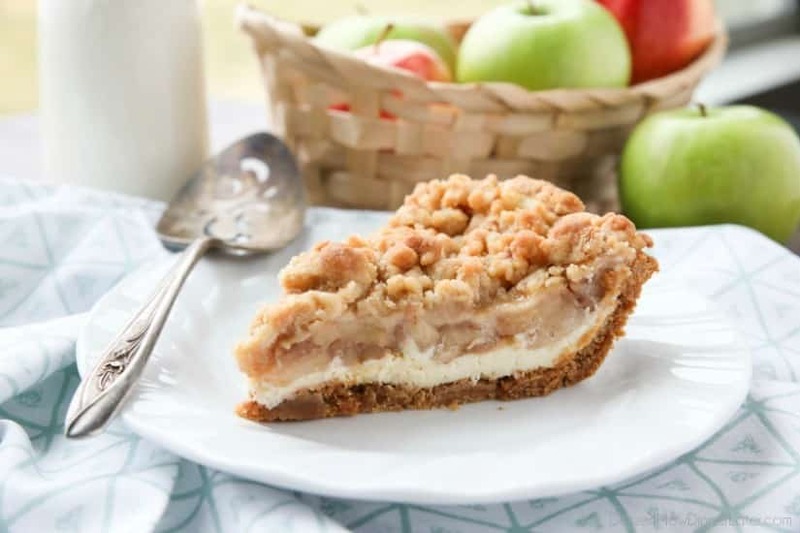 If you love apple pie and cheesecake, then this Apple Streusel Cheesecake Pie is for you! I was a little worried when I first threw this idea together that it would be too sweet. But I am happy to report that everything balanced out quite nicely. Using just enough sugar to enhance the sweetness of each element, without overdoing, it is key. Every time I make a pie I can’t help but think back to my childhood. Prepping pies for Thanksgiving and Christmas with my mom was one of my favorite traditions. One that I’m happy to pass on down to my children. My two year old is the most excited to be in the kitchen, so he usually helps me measure and pour things. I can’t wait to see where his passion for food takes him. 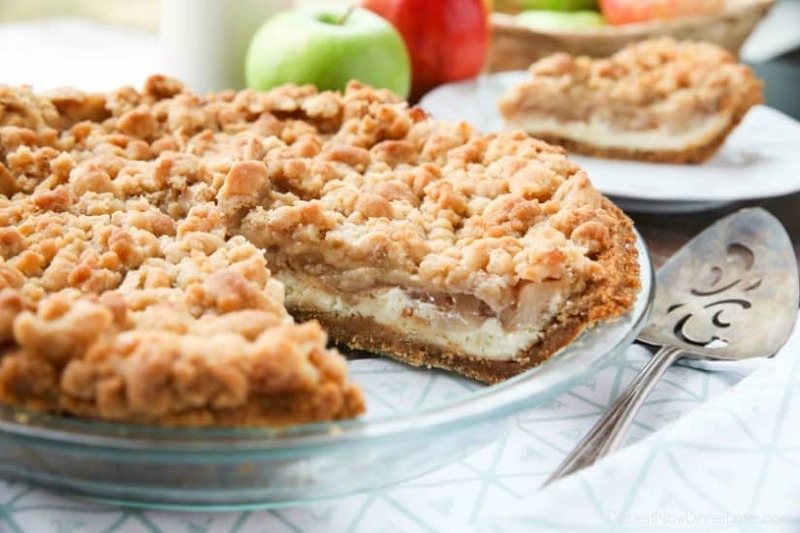 This Apple Streusel Cheesecake Pie is a match made in heaven. You’ll be savoring every bite with pure satisfaction. Make it soon! MAKE CRUST: Melt butter in a glass 9-inch pie dish in the microwave for 30-60 seconds. Add crushed graham crackers, brown sugar, and salt. Mix until everything is combined well. Press evenly onto the bottom and up the sides of the pie dish. Bake for 10 minutes. Let cool. 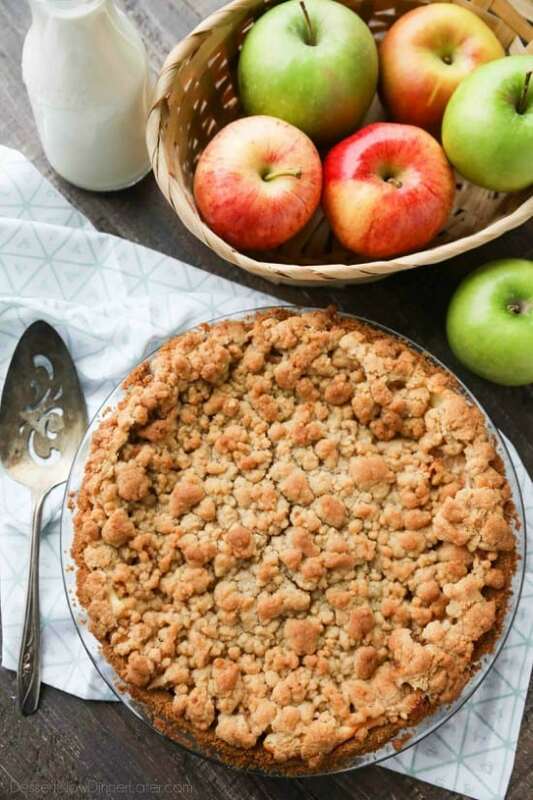 MAKE APPLE PIE FILLING: Melt butter in a large skillet. Add apples, lemon juice, brown sugar, cinnamon, nutmeg, corn starch, and water. Cook over medium-low heat for 10 minutes or until apples are almost fork tender, stirring constantly. If sauce gets too thick, add more water 1 Tbsp at a time until desired consistency. Let cool. MAKE CHEESECAKE FILLING: In the bowl of a stand mixer with the paddle attachment, beat the cream cheese until smooth. Add the sugar and flour. Mix until incorporated. Add the vanilla and egg. Beat until the batter is smooth. Set aside. MAKE STREUSEL TOPPING: Combine the butter, flour, brown sugar, and salt in a large bowl. Rub together with fingers until mixture clumps together in big crumbs. 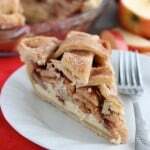 ASSEMBLE PIE AND BAKE: Pour the cheesecake filling into the cooked graham cracker crust. 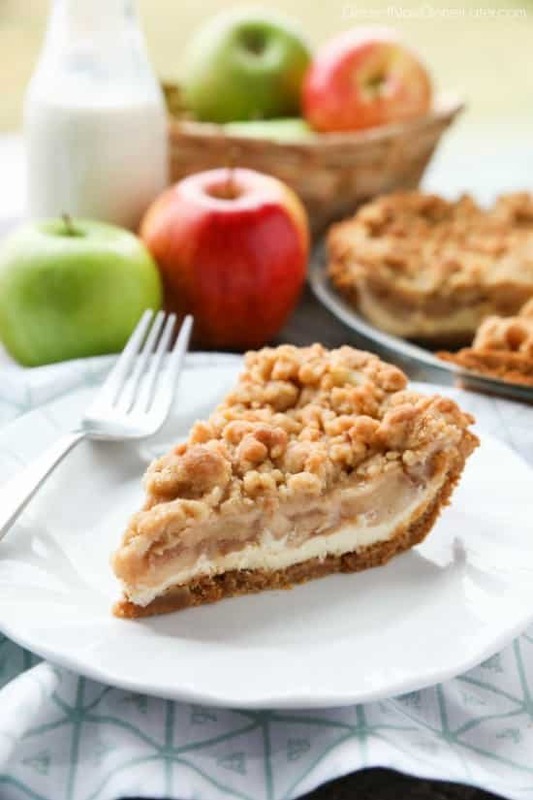 Carefully spoon apples evenly over the cheesecake filling. (They may sink a little bit.) 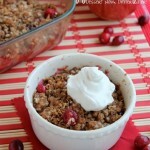 Sprinkle streusel topping over the apples. Bake at 350 degrees Fahrenheit for 35-40 minutes until streusel topping browns. Cool completely and REFRIGERATE at least 3 hours before serving. 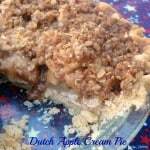 TIP: Use a serrated knife to cut back-and-forth through the crunchy topping and through to the pie. Thanks! Definitely a great combo! This was really good. I might add more apples. Anything with apples and cinnamon is my favourite. Glad you liked it! 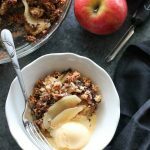 Definitely add more apples next time if you want more!